In this book, our most ambitious project to date, we trace the history of this often overlooked neighborhood from it's native roots through present times. Topics covered include: Early Settlement, Golden City Park, Sand Bay, Indian Creek, Dutch Farmhouses, Jamaica Bay Shell Fishing Industry, Indian Creek, Commercial and residential development, Schools, Houses of Worship, Canarsie Shore and Pier, Streets and many others! Illustrated with nearly 500 vintage photographs, maps, and other graphic material, this hardcovered book will container 200 pages. 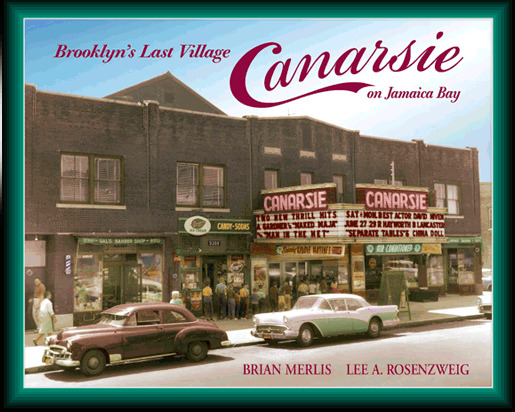 Only a limited press run (800) will be available. .
• Profusely illustrated with HUNDREDS of maps, illustrations, and vintage photographs, Merlis and Rosenzweig, authors of Borroklyn's Canarsie, take readers on another unforgettable journey back in time. A MUST for any collector.